Life with the Arabian horse is unlike anything you've ever experienced. Come see the ethereal mares, or nuzzle the soft nose of a week old foal, or schedule a visit to see an Arabian stallion in all his presence and glory. Whatever your interest may be, we are here to help you experience and enjoy the wonderful world of Arabian horse life! Enter your email below to receive the latest news on sales offerings, foal updates, and current events ​from Victoria Cross Farm. Owners Paul & Nikole Reece with their little prince Jack. 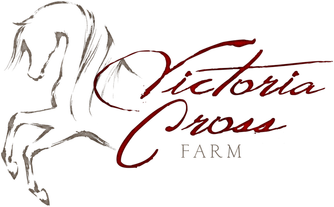 Tucked away among the rolling hills of Mid-Michigan lies the thoughtful and selective Arabian breeding program that is Victoria Cross Farm. Born from a little girl’s dream and a young boy’s love of horses, VCF strives to produce beautiful, correct, and athletic Arabians that bring joy to people of all ages. With horses on four different continents and scattered across the US, owners Paul and Nikole Reece now have the pleasure of watching the foals of “VC” compete and win in prominent shows throughout the world. Victoria Cross Farm is proud to announce their first US National Championship with the beautiful Magnum Chall son, Beckham UA!